For everyone along the East Coast of the United States, I hope this week's dispatch finds you safe and sound. It has been a tough week or so for folks there, what with an earthquake, followed by hurricane Irene. Hopefully it is all over now, except the cleanup of course, but you might want to keep an eye out for locust swarms and unexplained boils, just the same. My Outer Banks travel plans were completely wiped out by a mandatory evacuation, and that's a good thing. Irene came ashore on North Carolina's coast, and I wanted nothing to do with that. So I lit a trail inland and uphill as quick as I could, and found myself in Cashiers, NC. Over 500 miles from the sea, and at an elevation of 3,485 feet, it seemed to me to be about as far away as I could get, and still be in the Tar Heel State. And frankly, I would have settled for a Motel 6 along I-64, so long as it was high and dry. Imagine my surprise when I discovered a quaint and picturesque village tucked away on a plateau in the shadow of the Blue Ridge Mountains, surrounded by lush forests and cascading waterfalls. And timeshare rentals no less! Now about the name. If you want everyone to know you are from out of town, which they will anyway, make sure you pronounce it just like the word for the person who rings up your order at a grocery store. Or if you'd like to pronounce it correctly, you say it "cashers". No one I spoke to seem to be entirely sure from where the name originates. This was Cherokee hunting land and names like Chattooga and Tuxaway still abound. The most popular story for its present moniker is one that involves a lost horse, but you probably could have guessed that on your own. Seems one of the earliest white settlers in the area was a fellow named James McKinney, from South Carolina. He had a white stallion for whom he paid so much money, he simply called him Cash. One fall, as McKinney was getting ready to lead his herd of cattle back to winter in South Carolina, Cash went missing and McKinney had to leave without his prized horse. The following spring, when McKinney and his cattle returned, there was the white stallion just as fit as a fiddle. So McKinney took to calling the area Cash's Valley. Over time, it became simply "cashers". Which really doesn't explain why it's spelled as it is, and makes me suspect that the whole thing is just made up. But there you have it. 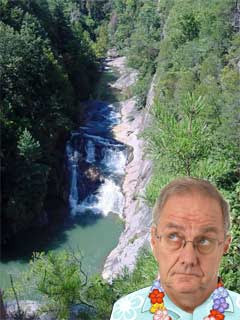 A popular nickname for this area is the "land of waterfalls" and it won't take you long to figure out why. There are 19 of them scattered in and around the area, with names like Silver Run, Sliding Rock, Rainbow, Turtleback, and Bridal Veil. But the biggest and grandest of them all is called Whitewater, and features a 411 foot vertical drop. There's a hiking trail to get you all the way to the top, and I highly recommend it. Located within Nantahal National Forest, and adjacent to the Great Smoky Mountains National Park, some of the best hiking trails and nature watching anywhere in the Southeast is all around you. Plus there is great public golfing at High Hampton Course, numerous Native American cultural and historical sites, excellent fishing and canoeing, fantastic restaurants, and quaint shops and boutiques. There are several timeshare resorts in and around Cashiers, and I chose a rental at Fairway Forest at Sapphire Valley. It features an outdoor pool, park with a picnic area, 18-hole PGA golf course, eight clay and two hard-surface tennis courts, and miniature golf - all on-site. My unit is a 2-bedroom/2-bathroom with stunning mountain views from an attached deck. RedWeek members rate this place 5-stars and have pretty much nothing but good things to say about it. Well, I am off to nearby Bryson City for an afternoon of high flying, zipline fun with Nantahala Gorge Canopy Tours. Do you know about these things? They strap you into a climbing harness and shoot you down a glorified clothesline suspended above the tree canopy at speeds up to 30 m.p.h. This outfit is the first in the area, and features lines with names like The Green Mile, The Burma Road, The Slingshot, and The Bermuda Triangle. Despite the scary sounding names, this is a perfectly safe and throughly enjoyable activity, provided you follow the safety instruction you are given by your guides, and use a little common sense. For example, you'd think it would go without saying that you cannot zipline while pregnant and/or under the influence of drugs or alcohol. Sadly, it does not.